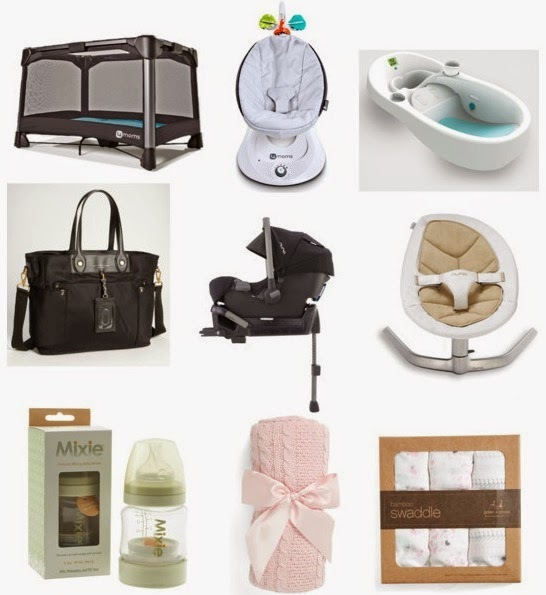 Today I just wanted to share a few of the baby products that we have purchased so far. I haven't done any post's yet about baby products, so I just thought I would share some of the things we have bought and are so excited to try out when she is here. All of the 4moms products are amazing. We set up the rockaroo and the playard and both were so easy to set up. This playard is so much easier to fold and unfold then some of the other brands that we saw in the store. And I love how I can plug in my phone to the rockaroo and play her music. We just got our car seat yesterday. We went with the Nuna Pipa car seat. I was going to get the maxi cosi but then I found the Nuna and it was a no brainer. It is one of the lightest car seats (only 7.7 pounds) which was really important to us. It has great safety ratings and I read some reviews about the maxi cosi that said it got hot for the baby because of the fabric. So living in Florida I did not want that. The Nuna Pipa also had a higher weight limit so you can use it longer. I am not having a baby shower, so throughout the pregnancy we have just been slowly buying things. I think we are getting to the point that we have all of the big items. Now its just little things we need. Also, just a quick pregnancy update. We had a ultra sound this week and the baby looks perfect. She is weighing in at 3 pounds 2 ounces. Which sounds big for 29 weeks but I know those measurements are not totally accurate. But we feel so blessed that she is healthy and growing on track. At 20 weeks I had a marginal placenta previa, which really worried me. They said there was nothing they can do accept watch it and hope it moves up away from the cervix as the baby grows. Well our prayers were answered! They confirmed this week that it has moved up away from my cervix and that I will be fine to have a vaginal birth. We were so relieved. I have decided that I am not going to share her name until she is here. I thought I would share it before but after talking to Matt about it we have decided it is best for us to just keep it to ourselves until she is here. So happy everything is going fine! all the best! hope you get good use of every single one thing! Yay! So exciting. Can't wait to see pictures of her when she's here! so glad that everything is okay with your little one! and I am definitely going to keep this list for when I am shopping for my own babies. thanks for sharing! Love this posting! I'm keeping notes of it for when I have my first mini! God bless you & your growing baby.